The winter season brings shorter days and colder temperatures. But that doesn’t mean you can’t stay active! Plan ahead, consider alternative exercises, and be prepared to readjust your workout routine as we move into the winter season. The simplest adjustment I have made that has kept me active during the shorter days is the purchase of a tiny but powerful flashlight. 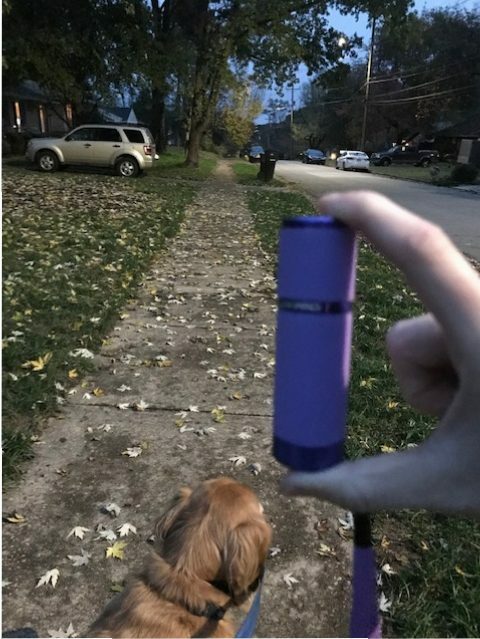 This flashlight has allowed me to maintain my evening walks with my dog, and to feel safe while doing so. See below for a few additional tips to stay active during shorter days and colder temperatures. Purchase a flashlight. As I mentioned above, a small handheld flashlight is key to staying active when it gets darker earlier. Even if you leave the house when it’s light out, be prepared with the quick onset of darkness. Keep it in your pocket or purchase one with a wrist strap to easily carry. This one I grabbed in the check out line of Lowes for a dollar or two and it was worked great! Choose well-lit streets and sidewalks for walking, jogging, or biking. Even if you carry a flashlight, be mindful of the light provided by streetlights along your route. Make sure you are in a safe area without a lot of traffic and move off to the side when a car goes by. Dress in layers. Remember to stay warm and dress in layers – as you move more you can take the layers off as needed. Or, as it gets darker you can put more layers on as needed. Choose light colors that are easier to see in the dark or consider a reflective vest. Don’t forget gloves or ear warmers – you might leave the house with warm hands but soon hey might get chilly (especially if you have to carry a leash!). Consider adjusting your schedule. Can you move your evening walk to a lunch time walk? Or instead of a 30 minute walk at night can you do a 20 minute morning walk and a 10 minute evening walk? Considering moving some of your activities to the daylight hours if possible. Try Youtube videos or exercise apps. Exercise indoors with the help of Youtube videos or an exercise app. There are plenty out there to choose from with a variety of exercise options available – zumba, body-weight exercises, yoga, you name it. Consider a month-to-month gym membership. If you are not typically a gym goer and are hesitant to sign a gym contract (usually for a full year), find a gym that offers a month-to-month style membership. That way, you can use as needed during the winter and then go back to your regular exercise routine when it gets warmer. How do you like to stay active when it’s cold and dark outside? Share your tips and thoughts below in the comments.